Assuming Chinese technological trajectories stay on the path they are on, trying to win wars by exploiting dominance of the air and sea is going to become increasingly expensive and come with a lower likelihood of success for the United States. Two of the Pentagon’s biggest acquisition programs, the Ford-class supercarrier and the F-35 jet fighter, already show evidence of the United States paying much more for a proportionally smaller increase in combat performance, a diminishing future operational return on increasing military investments. In other words, the cost curve and the performance curve for some major U.S. military upgrades do not match, and the cost curve is much steeper, something that may eventually force a change in U.S. strategy against the Anti-Access/Area Denial (A2/AD) threat. Consequently, both the assumption that U.S. strategy and procurement can continue as normal or that the U.S. should massively invest in radical new technology to dominate and defeat Chinese A2/AD may be misplaced. Instead, it may be technologically infeasible or too expensive to decisively “win” an A2/AD war in the Pacific in the next two decades. Consequently, future U.S. strategy may need to focus on preventing a Chinese victory rather than ensuring a U.S. one. Competing essays in the fall issue of Foreign Affairs by prominent U.S. national security figures confidently proclaim contrasting assessments of the U.S. military and what it must do to preserve its advantages in a potential clash with China. But for all their differences, both assert U.S. success in a conflict against China (so long as their respective remedies are followed by the next Administration). Contrary to these broad pronouncements, recent academic and think tank studies are pessimistic that U.S. primacy would unambiguously prevail against future Chinese A2/AD capabilities, whether or not the U.S. makes drastic strategic and technological changes to counter them. In their Foreign Affairs essay, “America’s Awesome Military,” Brookings military analyst Michael O’Hanlon and retired General and former CIA Director David Petraeus assert that the U.S. military is “awesome”, plays “in a totally different league”, and that this is unlikely to change soon. “Preserving Primacy,” by Texas Congressman Mac Thornberry and former CEO of the influential Center for Security and Budget Analysis Andrew Krepinevich, claims alternately that the U.S. faces “mounting threats,” “diminished stature” and “growing uncertainty.” Both believe U.S. interests in the Pacific can be defended against an ascendant China; O’Hanlon and Petraeus think this can be done “without radical changes or major buildups,” while Thornberry and Krepinevich insist “major changes” are necessary to preserve access to the sea, air, and cyberspace against China’s A2/AD capabilities. Optimism about U.S. primacy and technological edge against China ignores the trends that make maintaining that edge increasingly expensive. It also ignores inherent defensive advantages of A2/AD systems that require disproportionate technology and capability to counter. This means that the ability to translate that U.S. military edge into decisive victory will continue to erode in the face of maturing Chinese capabilities, even if they remain technologically inferior. Biddle and Oelrich, writing in International Security, find that by 2040 “Chinese A2/AD [will be] a real threat to U.S. interests in the Western Pacific that cannot be averted at a sustainable cost.” Instead of trying to defeat A2/AD offensively, they believe the United States and its allies should invest in their own comparatively cost-effective A2/AD capabilities to contain any possible Chinese offensive. [Current] carriers can generate approximately 120 sorties a day. The Ford-class carriers…are projected to launch around 160 sorties per day, a 33 percent increase in launch capacity. This seems very impressive until one realizes that the USS George H.W. 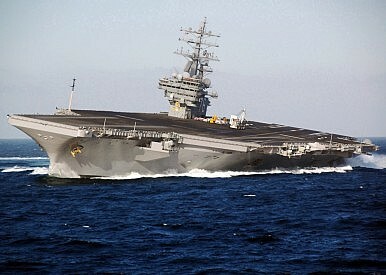 Bush, the last Nimitz carrier, cost $7 billion and the USS Gerald R. Ford is coming in at $13.5 billion. In the end, the nation is paying nearly 94 percent more for a carrier that can only do 33 percent more work. In addition to the Ford’s greater cost, there are doubts about the performance of its future air wing in a mature A2/AD environment. The multi-service F-35 program has been plagued with massive cost overruns, delays, and questions about its technology and combat effectiveness. A decade after its selection, the plane has only just been declared to have initial operational capability, even as recent Pentagon tests still find major deficiencies with its combat capability. Still, the Navy is confident of the as-yet undeployed F-35’s future promise. The admiral in charge of air warfare told The National Interest that “The F-35 is a quantum leap in air superiority—survivable, supersonic, comes with fighter agility and unbelievable, revolutionary comprehensive sensor suite,” providing naval air wings of 2025 major increases in capability. However, the other major customer for the F-35, the U.S. Air Force, has determined the aircraft will be unable to deliver required air superiority in the expected A2/AD environment by 2030 and is already developing requirements for a replacement “Penetrating Counter Air” platform. Given the F-35’s decade-long procurement journey, and the fact that it is still not fully deployment-ready, the requirement for an even more advanced follow-on aircraft to be available in the next 15 years underscores the long-term questions about a counter-A2/AD strategy. The U.S. military may be in a “different league,” but defeating advanced A2/AD is like a playing a different game and by someone else’s rules. U.S. efforts like the “third offset” may yet produce disruptive new technologies that would enable a genuinely decisive U.S. victory over mature A2/AD systems, so faith in both the present U.S. military advantage and the obstacles for ascendant competitors to realize an effective A2/AD shield is not misplaced. But current acquisition challenges and technological trends suggest it will become increasingly expensive just to maintain the ability to fight to a stalemate in the next two decades. At that point, the difference in cost of ensuring a U.S. victory versus simply denying victory to a competitor may motivate fundamental shifts in U.S. strategy, force structure, and military objectives. US Navy, Marine Corps Unveil New Strategy to Turn Tables on A2/ADPentagon Wants 'Arsenal Planes' to Beat China's Air DefensesNew US Defense Budget: $18 Billion for Third Offset StrategyUS Air Force: Russia Has Closed Air Power Gap With NATOWhat is the Future of Naval Warfare?